Last week I was sick, so I stayed home for a couple of days from work. Since there is absolutely nothing on tv during the day, I thought why not watch a marathon of extreme couponing because let’s face it, crazy people are entertaining! After a couple of episodes, the crazy bug must’ve bitten me because I talked myself into trying my hand at couponing. Now, I’m not going to go to the extremes that the people on tv go to by turning my garage into a pantry and making a stockpile to last 2 years, but I am going to work harder to find coupons for things I buy regularly. I came across a wonderful blog, The Krazy Coupon Lady, and I’m hooked. She matches up coupons with the best deals of the week at various stores such as Walgreen’s, CVS, Target, Wal-Mart, H-E-B, etc. The secret is to use a manufacturer’s coupon with a store coupon for items on sale. This way you’re saving the maximum amount possible, and yes it is actually possible to make money on some of the items! It’s a bit time consuming to match up the sales with your coupons, but I encourage anyone interested in couponing to check out her site because she pretty much does it for you. Now, here’s what I got on my first trips with coupons. 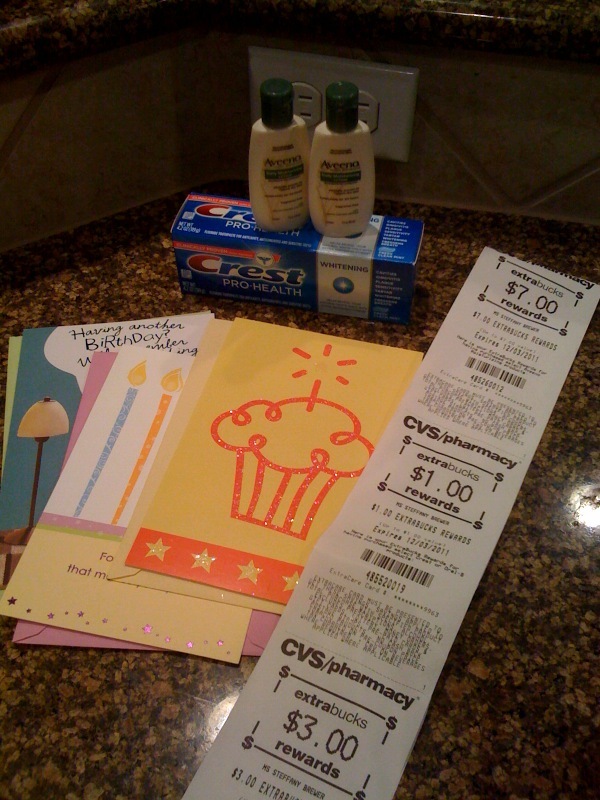 Crest Pro Health Whitening toothpaste was on sale for $2.99, down from close to $4.00, I used a $1.00 manufacturer’s coupon from Sunday’s paper (10/30) and received $1.00 back in Extra Bucks with my CVS store card. That’s like paying $0.99! I also scored big on a deal for Aveeno lotion. When you buy two of any size, you get $7.00 back in extra bucks. I bought the smallest size, 1 fl oz at $1.49 each, and I redeemed $1.50 in extra bucks from a previous trip to pay a total of $1.48 for two lotions. With the $7.00 extra bucks I got back, I actually banked $5.52. Finally, I took advantage of a deal on greetings cards. When you buy three American Greetings cards, you receive $3.00 in extra bucks, so I bought three $0.99 ones for a total of $2.97, and with the extra bucks, that’s like getting them for free! And the best part about this deal is that Derrick has his own CVS card that he registered separately from me, so I can go back with his card and get this entire deal again…. I just have to find his card first! I didn’t do so well at Target, but I did save money. I printed three coupons from Target’s website for apparel, and hit the clearance rack! The purple button-down cardigan was $4.98, and I used a $4.00 off women’s sweater coupon for a final price of $0.98. The navy sleeper t-shirt was marked down to $6.98, and I used a $3.00 off women’s sleepwear coupon for a final price of $3.98. 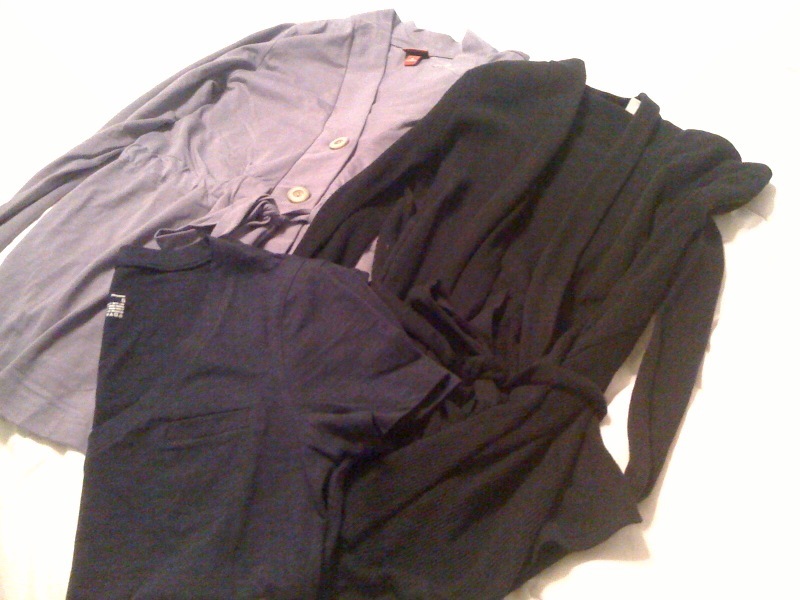 The black sweater cardigan was the most expensive at $9.98, and I used another $4.00 off women’s sweater coupon. I paid a total of $11.94 with a savings of $11.00 with my coupons. Note: I had to do two separate transactions to be able to use the two sweater coupons, so be sure to always check store rules before you make your purchases. I have much more shopping to do. I’ve got my grocery list planned out, and I’ll be shopping at Target, H-E-B and Walgreen’s this weekend because most of the sales end Saturday that I want to use coupons for. I’ll post my grocery list tomorrow, so you can score too! Happy bargain shopping everyone!